How Long Do I Have to Live With This, Lord? We love these message pens that are just $1.50. With each click it has a message about Jesus. When you are sitting there on hold with your health insurance (and maybe getting frustrated) start clicking and remind yourself who is really in charge! How's your week going? I hope the answer is "wonderfully!" But if it's not so hot, I understand that too. Sometimes it can seem like the days get more challenging all the time. Feel free to let your hair down here and be honest. And thank you so much for that many prayers that you have offered up on my behalf and the many prayer lists that you have put me on at your churches, etc. My physical therapist assures me that my hand is progressing well, however things will tighten up in the next few days as the tissues surrounding my four new joints "grab on." Evidently, if you have had joint replacement, you understand I am hitting the next level, where I will feel I am moving backwards, and yet it's a good thing because the healing is progressing. 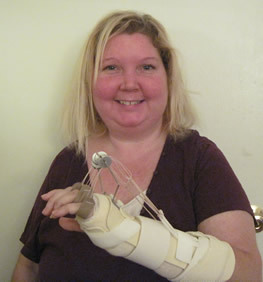 Being unable to do daily tasks or drive as I wear my splint 24 hours a day for the next five weeks is of course frustrating; and I found out yesterday that I won't be able to drive for some time even after the split is removed. I am taking one day at a time. Someone sent the story below to me earlier this week and it literally gave me goosebumps . . . and then a few tears at the end. I hope that it touches your day today too. Life is short. . . and oh, so precious. I arrived at the address and honked the horn. After waiting a few minutes I walked to the door and knocked.. 'Just a minute', answered a frail, elderly voice. I could hear something being dragged across the floor. After a long pause, the door opened. A small woman in her 90's stood before me. She was wearing a print dress and a pillbox hat with a veil pinned on it, like somebody out of a 1940's movie. By her side was a small nylon suitcase. The apartment looked as if no one had lived in it for years. All the furniture was covered with sheets. There were no clocks on the walls, no knickknacks or utensils on the counters. In the corner was a cardboard box filled with photos and glassware. 'Would you carry my bag out to the car?' she said. I took the suitcase to the cab, then returned to assist the woman. She took my arm and we walked slowly toward the curb. She kept thanking me for my kindness. 'It's nothing', I told her. 'I just try to treat my passengers the way I would want my mother treated'. 'Oh, I don't mind,' she said. 'I'm in no hurry. I'm on my way to a hospice'. I looked in the rear-view mirror. Her eyes were glistening. 'I don't have any family left,' she continued in a soft voice. 'The doctor says I don't have very long.' I quietly reached over and shut off the meter. We drove through the neighborhood where she and her husband had lived when they were newlyweds She had me pull up in front of a furniture warehouse that had once been a ballroom where she had gone dancing as a girl. Sometimes she'd ask me to slow in front of a particular building or corner and would sit staring into the darkness, saying nothing. 'You have to make a living,' she answered. 'There are other passengers,' I responded. I squeezed her hand, and then walked into the dim morning light. Behind me, a door shut. It was the sound of the closing of a life. I didn't pick up any more passengers that shift. I drove aimlessly lost in thought. For the rest of that day, I could hardly talk. What if that woman had gotten an angry driver, or one who was impatient to end his shift? On a quick review, I don't think that I have done anything more important in my life. We're conditioned to think that our lives revolve around great moments. But great moments often catch us unaware-beautifully wrapped in what others may consider a small one. Don't let guilt get the best of you! It's easy to feel guilty for soooo-o-o many things when you are chronically ill, isn't it? We feel guilty about the little things, like not doing the dishes; as well as the big ones, like not being able to attend a special event of a loved one. We feel guilty for asking for help (especially for the umpteenth time) and we feel guilty we aren't able to do more for those we love and reciprocate their help. No matter how much we do, it never seems to be enough. And ironically, when we are having a decent day without a lot of pain, we can even feel guilty among our chronically ill friends that we had a reprieve. Or maybe you "got caught" by your child's teacher playing at the park when you said you couldn't help out with the class party just yesterday. You can also read an article I wrote called, "Do I Have to Feel Guilty When I Feel Okay?" Tell a friend what you can do!